After Image: A Reunion | To Be, To Be. Tutubi. September last year, I witnessed the Eraserheads reunion concert. Then yesterday it was the reunion-of-sorts for the After Image. I have seen both of my favorite bands perform live on stage for the first time! But last night, I was front row and center and I have the videos to the five songs that they sang to prove it. Yep, they reunited last night for a very special event indeed and I was privileged to be part of it. Six Cycle Mind was also at the event, and did you know that their drummer is nephew to After Image's Rogie Callejo? Hmmm, musical genius runs in the family. 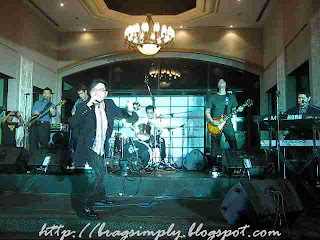 After the Eraserheads, After Image is my favorite band. I sang to their songs Next In Line and Habang May Buhay during my college years. I was very sad to see them disband, but life goes on as they say. Other bands came but I have never liked any other except for those two. I never get to see After Image perform live way back then and I was indeed very lucky to see them last night. I know that no reunion concert is in the works and this was one rare occasion for them to be together indeed. And after all this time, After Image still rocks!